Warning: This article has been written for dessertarians by a dessertarian. If you do not have a sweet tooth, grow one. It’s that time of the year when your waistlines expand and your pockets shrink. ‘Tis the season of dessertarians! Festive season! It’s the time when the mithaiwaalas dole out their best, the air outside each store fragrant with aromas of desi ghee and butter, luring you like a siren’s call. The thing I like the best about Indian festival season is the myriad dessert options. And, oh boy, are we ever spoilt for choice! There’s something for everyone, even the crabbiest of the lot who dislike anything sweet (yes, such people actually exist). So, for this season, here are my top picks for places to go dessert/confectionery shopping. About: Everybody who’s anybody has heard of Emerald. The confectionery available here is the stuff dreams are made of. What sets this store apart from others is the fact that their products are organic, and do not contain chemicals or preservatives or food colours. What they do contain, however, is millions of calories. This, lads and lasses, is sin in edible form. What should you try: While they’re very famous for their dry fruit laddu, Putha Rekulu, and Milk Mysorepak, I personally love their Khova Badushah. The Gulab Jamun is to die for. Final Word: If you want to know what heaven tastes like, go to Emerald. About: Do not be deceived by its dingy, hole-in-the wall appearance because this store is “dessert royalty”. The shop’s been around for four decades managed by three generations. Trust me when I say they know their craft. What should you try: I don’t usually like cottage cheese or cream-based sweets, but for Balaji Ratanlal, I make an exception. 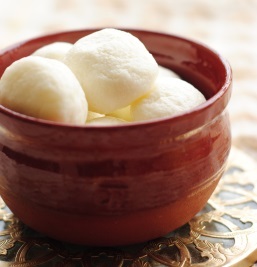 Their Rasgullas are happiness in a pot. Also give their Ras Malai a shot. Like Lays, no one can eat just one. Final Word: No frills, no fuss. Just traditional desserts with an old world charm. About: These guys were famous for their stall at the annual Hyderabad Exhibition. And now they have an equally famous store selling the choicest of confectionery. Reasonably priced and not very heavy, the sweets are every budget spender’s delight. Not only this, they’re one of those very few sweet stores that have a selection of vegan mithais. What should you try: If you’re worried about putting on those paltry few calories, try their Anjeer Khus-Khus Roll – made out of figs and poppy seeds, they’re comparatively less threatening to the waistline. 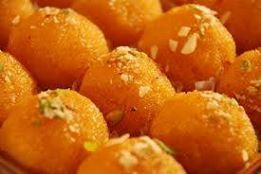 Not worried about calories, try their Motichur Laddu, and Gajar Halwa. Final Word: Healthy, vegan, and pocket-friendly. Need I say more? 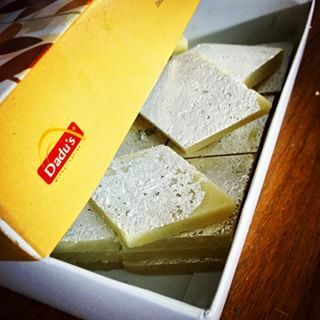 It is practically impossible to write an article listing the best sweet places in Hyderabad and not include Dadu’s. This is the go-to place for all those who enjoy rich confectionery. Come festivals and the place is sold out. It’s probably the only store in Hyderabad where you’ll have to order sweets in advance if you want to take home some on a festival. I suppose that says it all. What should you try: While they have a delectable selection of sweets, the only thing I enjoy eating here is the Kaju Kathli. Everything else is too sweet (yes, there is such a thing as too-sweet dessert) for me. 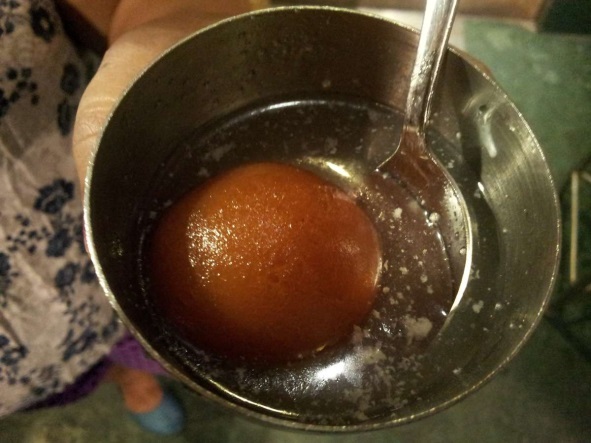 Final Word: Head here if you like desserts drenched in ghee and full of sugar. 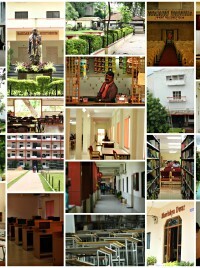 About: This place has been around for quite some time and for a good reason. They have some absolutely mouth-watering desserts. Every time I go there, I start with the dessert du jour. After all, did someone wise not say “life is short, eat the dessert first”? About: Quite a hit with young people, this is a trendy and quirky little café that is fast gaining reputation for its food-coma inducing desserts. Cupcakes in Hyderabad are suddenly the “it” food. And Guilt Trip has definitely built on that. 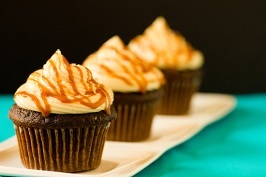 What should you try: In cupcakes you definitely ought to try two flavours – Sea-Salt & Caramel; Peanut-Butter. 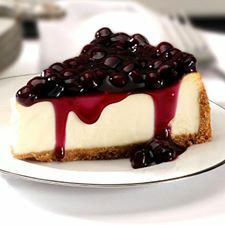 In addition, try any of their cheesecakes – they’re quite decent. Final Word: Though not very pocket friendly, the desserts here are a guilty pleasure indeed. This, folks, is not an exhaustive list. There are more – Tiwari Bros (Khairtabad) or the very fancy Labonel (Banjara Hills), Conçu (Jubilee Hills), Menchie’s (if you like fro-yo) and so on. But, the ones mentioned are at the top of my list. Now, I don’t know about you, but my sweet tooth is demanding a fix. So, ciao and happy binging! 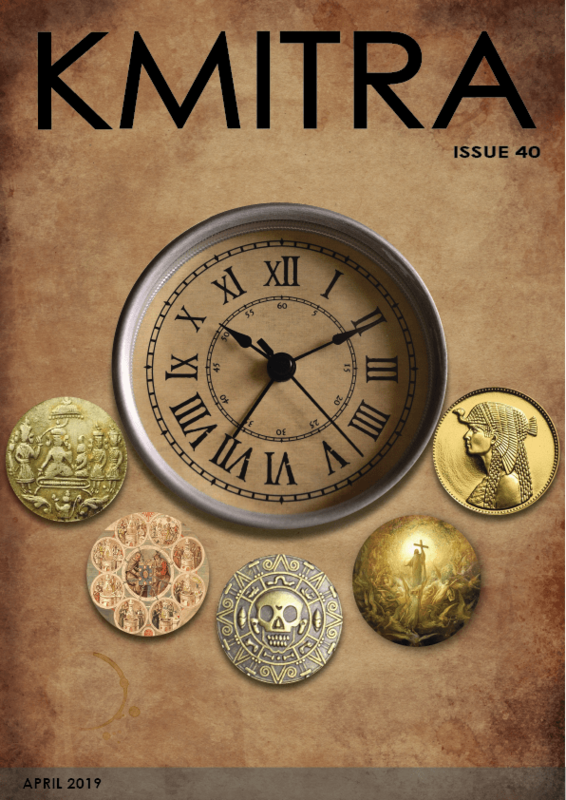 Shwetha…. I have sweet teeth…… 7 likes for 6 sweet shops and 1 for u !!! FOR THE LOVE OF ALL THAT’S OPEN!